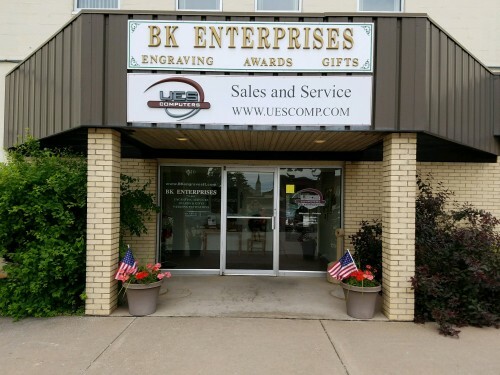 BK Enterprises is located at 410 S. Stephenson Avenue in Downtown Iron Mountain, Michigan. If you are traveling in from the North (Bay College West end) - head straight towards the downtown and take a right onto West Hughitt Street which is the street right before Antonio's Pizza. Take the first left into the large parking lot and we are down on the far end. If you are traveling from the South (Wal-Mart end) - head straight into the downtown. Watch for the tall First Bank and Farmers Insurance building on the left at the first stop light entering the downtown where there is a left turn lane. (That is the only left turn lane for several streets.) Turn left and continue past the Old Braumart down to the stop light. Turn right onto Carpenter Avenue and at the next stop light take another right onto West A Street. Our large parking lot is over the railroad tracks on the left. Our main door is located under the brick column entrance from the parking lot with BK Enterprises inside to the left. Please feel free to call 906-774-0097 for any assistance - we look forward to seeing you!